I recently tried to find a good software to convert a bunch of videos to an iPad compatible format on OSX without buying some weird FFMPEG frontend. 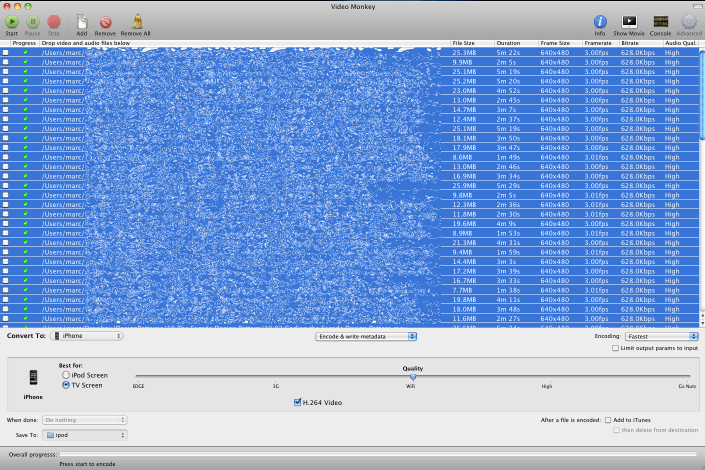 First of all, the search for graphical OS X video encoders is horrible. There are a LOT of sites spamming the google search results and filtering them out is almost impossible. 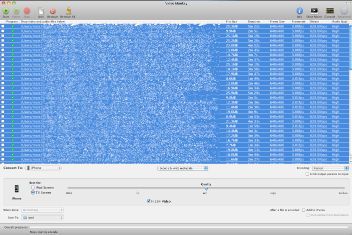 At first, I tried using handbrake. Handbrake does an really nice job when it comes to converting DVDs or single movie files, but it is not that great when it comes to batch converting 100 small video files. The formerly commercial Visualhub and iSquint are available for free now, but only in their raw sourcecode form. Compiling them would probably also include compiling ffmpeg, x.264 and about a gazillion other libraries which is not something I was looking forward to just to convert a bunch of videos. My final choice was Videomonkey. It seems to be a modified Visualhub (or as it is called now: "TranscoderRedux") that is in somewhat active development. The latest binary release at the point of writing is version 0.8 and got released April 2010. While it doesn't have a proper iPad template, setting the preset to iPhone, selecting the "TV Screen" option, enabling H.264 and setting the quality slider to "WiFi" gave me quick encodes with acceptable quality. If you feel adventerous, there are links to 64 bit builds of ffmpeg and iPad presets in videomonkey's forum on sourceforge. mysqldump -uUSER -pPASS --single-transaction --extended-insert --quick -v DATABASENAME | gzip | ssh -C user@newserver  "gunzip | mysql -uUSER -pPASS DATABASENAME"
I decided that using a database for my blog was a bit of an overkill. This blog is now running on serious and uses just a plain textfile backend. Most of the old links should work without a lot of work. There are still some encoding errors here and there, I'll fix those when I have a few minutes of free time and motivation. as usual: you might brick your phone if you don't know what you're doing! so don't! Klingt komisch, ist aber so. In einem Blogpost verschenken die Jungs von Ingate.de einen XEN VServer. Generell bekommt man bei Ingate recht interessante Server. You have to reset the modem every time a new MAC accesses it! If you are trying to work with websites, you'll sooner or later find yourself in the situation that the advertised website encoding is in fact not the encoding of the stuff the server sends you. In this case, something said the string (aka: website) you look at is ASCII-8BIT encoded, while it is in fact not. This works ok for my area as I don't really care about a few missing accents or umlauts. If you actually want to keep the document in an ok form, you might want to look at the .force_encoding() method. a SIP account (you can get them basically everywhere. ekiga probably works. I used my dus.net account. After you have an active google voice account, all you have to do is tell google what number to dial. You don't need a proxy for that anymore. Google will then call your "american landline" first, ipkall will forward this to your SIP account. Upon picking up the phone, google will start dialing the number you set on the website and from then on, it'll be just as if you dialed that number yourself. Just in this case: it's free.